Introducing new Progress Widget, simple Drag-and-Drop, resizable widgets, and Dashboard level date ranges! November is shaping up to be a big month for our Report product. We introduced a new Progress Widget, resizable widgets, added drag-and-drop, and allow users to set a dashboard level date range! We also shipped some less visible but impactful items. We improved backend functionality to reduce reload and compile times, corrected the disappearing goal line, and now track even more events in Mixpanel. You can track specific performance goals or KPIs across accounts for a selected time period. Use the new Progress Widget to get a quick view of how certain campaign/account KPIs are performing at any given period. Let’s say your target budget for the month is $10,000 across your selected campaigns. 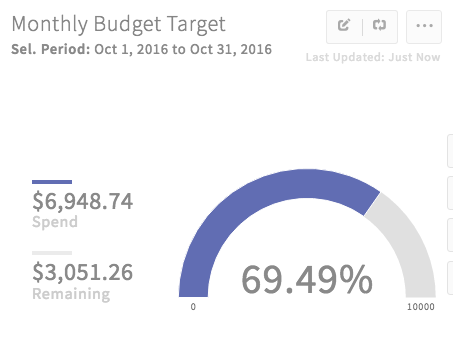 The Progress Widget will show how much of your monthly budget you’ve spent, compared to your total target budget. You can see by the 15th, you’ve spent 69.49% of the total monthly budget. After receiving a lot of helpful feedback, we wanted to give our customers more control over customizing their PPC reports. Prior to this release, widget only supported full-width. This made it difficult to visually show performance trends across different widget types (line graph, pie chart, bar graph, etc). Now you can customize your reports to show performance trends in the same view. With resizable widgets, you can easily resize widgets to widths of ⅓ , ½, ⅔, or full. Before introducing drag-and-drop widgets, in order to rearrange the widgets within a dashboard, users would have to delete the entire widget, and then recreate the widget in the desired section. Drag-and-Drop makes rearranging widgets as easy as possible. Simply drag the widget within the same section or a new section to move widgets around the dashboard in seconds. Before introducing Dashboard Level Date Ranges, we noticed many of our customers had to painfully edit each widget in their dashboard to view performance data for a different date range. Now when you edit the date range for an existing dashboard, all your widgets will update with data from the newly selected date range. Report Email Unsubscribe Issue: Unsubscribe link was not working in scheduled report emails. Fix: Now you can unsubscribe from report emails. Goal Line Issue: when a customer would set the goal line higher than their highest widget stat, the goal target line would disappear. When the goal line value is not within the range of the Y axis (which is set by the values of the chart) the user cannot see the goal line. Example: if a customer selected a bar graph widget to display total conversions and he wanted to adjust the target goal to 155 conversions because he received 140 conversions, the goal line would simple disappear and become unresponsive with the new conversion target value. Fix: the goal line resizes the Y axis, so the goal line is always visible. X-Axis Issue: When resizing widgets the dates on the X-Axis would overlap, making it unreadable. Fix: customers can see individual days on hover, but only show some dates on the x-axis of the widget. Dashboard Widgets Flicker Issue: When you open a dashboard with widgets for the first time and click the edit modal, it flickers quite a bit because all the widgets are loading sequentially and causing re-renders. Fix: Widgets are now loaded asynchronously in parallel. The Progress Widget Issue: the widget would appear at inconsistent heights. Fix: In almost all cases, the text and the progress arch are clearly visible. In addition, the widget now uses the dashboard default date properly. Flexible Widget Issue: Text in ⅓ widget sizes would not adjust to the widget size. Instead it would continue on the text line outside of the widget. Fix #1: While hovering over a ⅓ width widget, the Last Updated date, located in the upper right, splits to 2 lines. Any widget width on browser at smallest width will also split to 2 lines. Fix #2: The Progress Widget will no longer cut off in PDF and Web Report formats. Create a unified Report that you can then easily share, markup, annotate, and customize with the conversion data you're already collecting in other marketing tools. Get a full view of which ads are the most valuable and move the needle for your most important business metrics. Soon all AdStage Report customers will be able to generate tables, summary, and chart widgets using Facebook data including Demographic, Geographic, Placement, and Page insights. Get the latest product updates, best practices, and tips to get more from your PPC Reports.